The Priesthood deemed the site sacred, as evidenced by the orientation of the myriad trails gifted to the desert sands by the revered sidewinders and their serpent-kind. The Oaiti Temple, once completed, offered a small sanctuary on the route east from Khopshef Province to the city of Luxor. Lhatar, a ranked priest of Set, presided over the temple and ordained its completion through a magnificent weeklong sacrifice of surviving slaves to the mighty Serpent. The gift of power did not flow freely from Set, and in Lhatarâ€™s quest for arcane knowledge through study and worship many captured souls crossed to the realm of death in the name of the Snake Lord. Followers found convenient offerings through the abduction of the infidel nomads north of the Styx in the lands of Shem. The unfortunate merchants and the clans of the Zuagir wanderers suffered long under the dedications of the priests-in-training. Lhatar benefited greatly over the years, with Set taking favor on the priest and allowing advanced knowledge of the arcane to flow into his awareness through constant study of the texts. Placing high value on power through numbers, Lhatar assembled a harem of devoted apprentices to aid him in the more complex rituals and dedications. Of these, Daecora was his most favored and lethal Adept. The abilities Lhatar wielded became widely known through stories passed along the Shem caravan routes, of men set afire from the inside out or felled by great bolts of lightning from open sky, and the Zuagir hated and feared the Snake-priest in equal measure. The slaughter of their people would be stopped, but not through hasty action. The threat posed by Lhatar and his mistress, Daecora, induced a quiet search for a weapon that would even the odds. Such a weapon was eventually uncovered in the form of three artifacts presented by an unknown band of Wanderers: two great silver disks each an arm-length in breadth and inscribed with foreign runes, and a chiseled pendant of obsidian and emerald entwined, resembling a crystalline blossom. The Zuagir at first thought the items to be warded shields and a jewel charmed for protection, however, the Wanderers soon explained the arcane devices and the Zuagir planned their assault. As a moonless night enveloped the land, two bands of Zuagir approached the Oaiti Temple from east and west, encroaching on the perimeter as though mandibles of a giant scarab. Sentinels were dispatched with silent efficiency, as were the sleeping acolytes, and the raiders made their way to Lhatarâ€™s private chambers with the artifacts in tow. The scales of fate tilted in favor of the Zuagir, as Lhatar remained in slumber alongside the mistress Daecora. Timing was critical to ensure Lhatar and his whore could not react with their foul spells. An assassin pierced the dread-priestâ€™s heart with a Grol-bone dagger, precisely as a second deftly cleaved the head in one strike of his scimitar. Even as Lhatarâ€™s heart burst with the thrust of the dagger, Daecora was similarly wounded but with skillful intent to delay death. The dagger remained in her beating heart, and she was pulled from the bed and bound at wrist and ankle. Behind the assassins, the wielders of the artifacts stood with one of the great disks before them. The Wanderers had explained the ancient disks were born of great evil, and as such, sought to draw the essence of all darkness to them. Without delay, the runes inscribed upon the silver disk ignited in white radiance upon the death of Lhatar, slowly transitioning to a dusky blood-red aura as the life force was consumed. As instructed by the Wanderers, the obsidian-emerald pendant was quickly fitted to the center indentation. The core of the disk rotated independently, locking into place as the lines of the central rune lined up. Lhatar was sealed. Daecora watched in horror and cursed the assassins through the short, jagged breaths allowed by her penetrated heart. The priestess vowed all would die before they left the Temple. 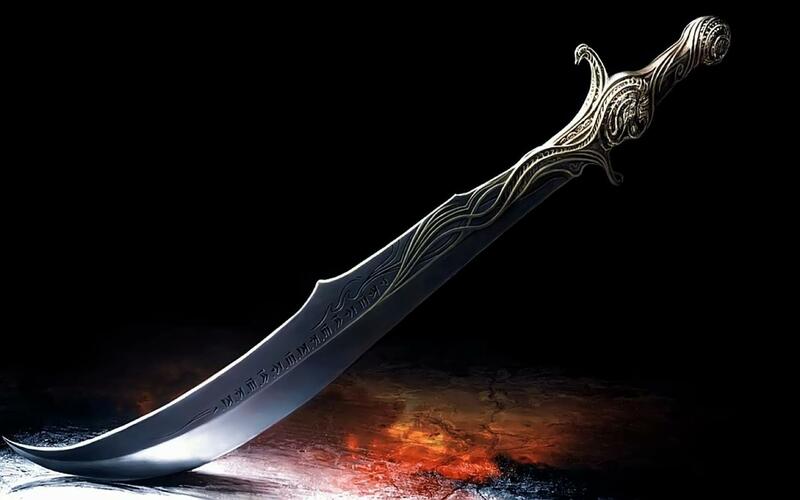 As the second disk was placed before her, she heard the song of the scimitar from behind as the blade was removed from its sheath. One final enchantment left her lips as the weapon arced through flesh, tendon and bone. The ritual repeated, and the runes of the second disk faded to red. It was sealed with the obsidian blossom and all was still in the night air. The assassins left the chambers and descended the steps of the Temple to meet their awaiting clansmen. The pendant-key was placed on a chain and around the neck of a bearer, and each disk assigned to a man in separate parties. Three bands would set out from Oaiti, dispersing the artifacts far across the lands so that that the tyrant-priest and his apprentice-whore would forever exist in eternal imprisonment, never to seek revenge from beyond the realm of death. As the men wished each other luck and prepared to set off, a foul wind swept across the desert with ferocious power from the south. Sand and rock scoured the Temple and surrounding huts began to fly apart. Great obelisks cracked and tumbled. Exposed flesh was stripped away as the men ran from the crumbling Temple in the choking maelstrom. The pendant-bearer made his way to the north face where he hoped to find shelter from the death-laden wind, but was instead greeted by great rumbling. Gazing upwards, he was horrified to see a massive block of stone dislodge from the Temple directly above him. He had neither the time nor the breath to scream. The storm continued until the Temple was little more than scarcely exposed ruins beneath the sands. Three Zuagir escaped to the north, and one disk they did carry. The legends maintain that as the sands quieted to rest, the last rustling of the wind carried the final whispered enchantment of Daecora to their ears.